Directions (1-5): Refer to the data below and answer the questions that follow. Five friends – P, Q, R, S and T - decide to read seven books numbered from 1 to 7. Books 1, 3, 4, 5 and 7 can be read in one week. However, the time required to read books 2 and 6 is 2 weeks. Each one of them exchanges the book in library at each weekend, only after he finishes reading it. Book 3 is a second part of book 2 so one can read Book 3 only if book 2 is already read by him. In the first week, P is reading book 1; Q is reading book 2 and so on as in the alphabetical order. They decide to exchange the books in the numerical order of Books. Note: If the book is not available as per numerical order, then they got the book with next serial number and so on. If a Book has second part, then reading the both part of the book is considered as completing a book. Book 7 will be followed by book 1 for each of them. They decide to meet till 10 weeks. Each friend reads a book only once. If, for a person, no book is available for a particular week (either because he has already read all the available books or he cannot read the available book or the book that he has to read is taken by the person who is before as in alphabetical order), then that person does not read any book during that week. 1. Who among the following reads Book 1 in the Week 6? Since, Book 3 cannot be read without reading Book 2; R reads Book 4. T and Q continue to read the same book; as Book 2 and 6 takes two weeks to complete it. Also P cannot read book 3 as one must read Book 2 before reading Book 3. Each exchanges their books as per numerical order. R and T needs Book 2, but P took the book already. Without reading Book 2 he cannot read Book 3 and also he read all other series of books. So, R and T have no books to read. S needs Book 6 but it is with Q, so he has no books to read. 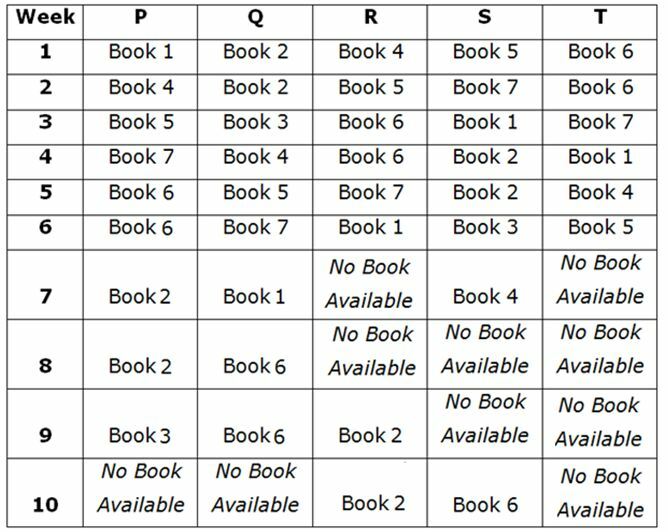 P still has Book 2 so R and T also have no books to read. Still Q reads Book 6, so S has no books to read. Also R takes Book 2 so there is no book for T to read. P and Q have read all the books. So, there are no books left for them to read. Also R takes Book 2 so there is no book for T to read. 2. Who among the following reads minimum number of books at the end of Week 4? 3. Which of the following Book does T reads in week 7? 5. Which of the following Book does Q reads in week 8? (Directions 6–10): Following questions are based on the 5 given combination of numbers and words, each consisting of a 5-digit number. Study the following information to answer the given questions. If all digits within 5-digit number are arranged in ascending order then, what is the difference of sum of digits of 2nd lowest to 2nd highest number after rearrangement? 7. If ‘2’ is subtracted from 1st, 3rd& 5th digits and ‘1’ is subtracted from 2nd& 4th digits in the 5-digit numbers then, how many newly formed digits are perfect square? Thus, only one such number are possible = 16384. 8. If 1st and 3rd& 2nd and 5th digit in the given 5-digit numbers are interchanged then, what is difference of 2nd lowest to 2nd highest number after rearrangement? 9. If all 5-digits numbers are divided by its highest digit within the same number then, for how many numbers obtained remainder are non-prime digit? 10. If all 5-digits in a number is added and arranged in descending order. Then which of the following is third from the right end? Five friends – P, Q, R, S and T – decide to read seven books numbered from 1 to 7. Books 1, 3, 4, 5 and 7 can be read in one week. However, the time required to read books 2 and 6 is 2 weeks. Each one of them exchanges the book in library at each weekend, only after he finishes reading it. Book 3 is a second part of book 2 so one can read Book 3 only if book 2 is already read by him. 1) Who among the following reads Book 1 in the Week 6? 2) Who among the following reads minimum number of books at the end of Week 4? 3) Which of the following Book does T reads in week 7? 5) Which of the following Book does Q reads in week 8? 6) If all digits within 5-digit number are arranged in ascending order then, what is the difference of sum of digits of 2nd lowest to 2nd highest number after rearrangement? 7) If ‘2’ is subtracted from 1st, 3rd& 5th digits and ‘1’ is subtracted from 2nd& 4th digits in the 5-digit numbers then, how many newly formed digits are perfect square? 8) If 1st and 3rd& 2nd and 5th digit in the given 5-digit numbers are interchanged then, what is difference of 2nd lowest to 2nd highest number after rearrangement? 9) If all 5-digits numbers are divided by its highest digit within the same number then, for how many numbers obtained remainder are non-prime digit? 10) If all 5-digits in a number is added and arranged in descending order. Then which of the following is third from the right end? Hence, option a) is correct choice.